There is no written rule on how a restaurant website should be structured, but the easiest way is to think of what your customers would look for. If they’re on your website, they probably want to see the opening hours, the menu, if you have any specials, the drinks and, of course, a phone number and a contact form in order for them to book a table. These details should be prominent right on the homepage or clearly accessible from the navigation. Always a good idea to have a few lines prepared about your business, maybe something about the chefs, kitchen, local suppliers or the history of the place. A good practice would be to have all this information properly arranged on the main page (Home page). You want your customers to be engaged from the first glance they have on your website. Where? How? Why? And how much? Those should be the main questions your website should answer to. Another important thing are the images. “A picture is worth a thousand words” might sound like a cliché, but it’s actually so true. We’ve discussed with customers who said they decided to visit a place just because of the images they saw on the website. You can use your phone; the cameras are good enough to take quality images. But always take care of how the food is arranged and how the light in the room is. Don’t take just one photo. Move around the table and take 100 shots, from all the possible angles. That way you can make sure you’ll have at least one good image for your website (and social media). With all these in mind, now we’re ready to build the website for our restaurant. If everything is prepared, it should take less than an hour to have a beautiful restaurant website built. For the next step, you need those beautiful photos you took with your camera. We’re going to replace the images on the homepage slider. 2. Click on the Slider, then on the gear wheel that appears on the top left side of the slider, in order to open its settings. On the left sidebar, now click on Slides Order, like in the video below. Just add more slides and remove the existing ones (Or keep them as well, if you want). Also, you can just drag and reorder the slides. 3. Beneath the slide, there’s the opening hours and the phone call. It’s a good place to keep these information, because it’s visible on the main screen, when a visitor lands on your website. We recommend you to hit SAVE every time you are happy with a change, to make sure you don’t lose any of your work. Below, you have the section dedicated to your restaurant. As mentioned earlier, add here any relevant info that could make your clients more interested in your local. 5. Finally, make sure the map shows the right location of the restaurant. 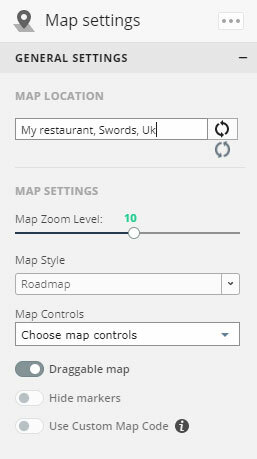 Click on the gear wheel, in order to open the map settings. That’s it on the Home Page. Now hit “SAVE” to make sure all your changes will be saved. 6. It’s now time to edit the other pages. In order to navigate inside the Editor to a different page, click on Posts and Pages, from the left sidebar. On the pop-up, click on the Edit icon, like in the animation below. To edit the other pages, just follow the same rules of swapping the images and replacing the text. And it gets even better. What I forgot to mention is that the website is mobile ready, so everything you just did for the desktop website, will rearrange in order to have a friendly layout on mobile phones and tablets. 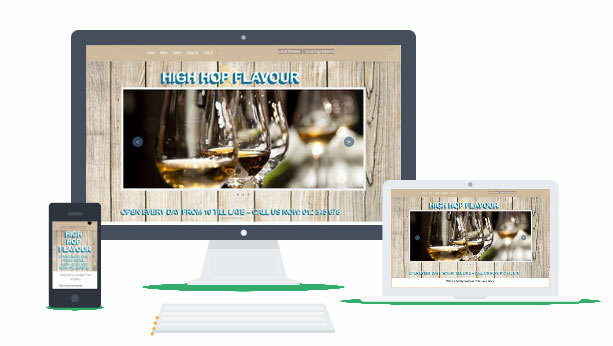 The above is one of the easiest ways to build a professional restaurant website. But why stop here? You can customise everything on the website, adding your own background, your own images, and colour scheme. Colours are proved to influence a user’s behaviour. Use this knowledge to your benefit. Various colours can influence your customers’ mood or boost appetite. The template we used as an example has a dominant brown. Brown is an earthy colour that helps guests relax and feel comfortable. It can also give customers a sense of support and stability, reliability, a sense of tradition. White inspires freshness, a relaxed and leisurely feeling. Can be used on your landing page, making the content more visible and accentuate your call-to-action. Black is mostly used to make another colours pop-up. Inspire elegance and a classy look. Food photography looks great on a black background. Red is most often used by fast food restaurants as it is the symbol of excitement, secret desires and confidence. With our website builder, it’s so easy to add a contact/feedback form to your website. Just drag one from the Draggable Elements, and check the settings, to make sure it has your favourite layout. Powered by Federation of Marketing Ltd.